We’re still about a week out from any major standard MTG event (GP Houston), but there is one thing that we’ll have a lot of this weekend and next: RPTQ results. During this weekend and next players from all over the world will be competing in their regional pro tour qualifiers for a chance to play in the Shadows Over Innistrad Pro Tour. These are high level players that should be pushing the limits of our known standard archetypes, and even creating some new ones of their own. I’ve already talked about most of the cards I think have a chance of breaking out in standard from white to artifact, and today I’m finishing up my articles with Multicolor, Colorless, and Lands. What’s worth picking up and what’s a waste of time? Before we go into that, let’s look at what I said about these cards back during Battle for Zendikar standard. Ugin, the Spirit Dragon – HIT. When I talked about Ugin last time, he was JUST starting to show his power level in Eldrazi ramp decks, but it wasn’t until a few weeks later that Ugin rocketed upwards in value. He hit 5000-6000 yen here in Japan at one point, but has since settled back down. In the USA he’s $40, which is about $12 more than he was when I said to buy in. Glad I got mine when I did. Dragonlord Atarka – MISS. While she did see a lot of play during those first few weeks of GR Eldrazi ramp, Atarka has since taken a back seat to other cards in the Eldrazi decks such as Worldbreaker and had lost some value. She’s down about $2.50 from her previous price of $11. Narset Transcendent – UNCLEAR. She hasn’t gone up or down since last time, so I can’t really say suggesting to buy her at the previous price was a bad idea. I was just a little too early with my previous suggestion I think. Sarkhan Unbroken – MISS. Not such a bad call. He was $7 last time and is $6 now, but the odds of him showing up seem less and less. Ugin has been repressing him and other planeswalkers too much. Shame as he could be good without the spirit dragon keeping him down. Utter End – MISS. Although it’s lower than what it was last time, I was actually right on this card. It initially doubled in price and hit about $4 in standard, but lately it’s dropped from a lot of sideboards and is back down to $1.25. Anafenza, the Foresmost – HIT. I suggested that she was a sell at $8.50 and that ended up being her best price during BFZ standard. Currently at $4.75, the boat seems to have left on making a profit on her. Crackling Doom – HIT. Another card that hit it’s peak during BFZ standard. I said sell at $3.50, and now it’s $1. Still a great card in standard, but not needed any more with 2 months to rotation. Mantis Rider – HIT. Before Ugin and Eldrazi put the smack down on Dark Jeskai, it was the talk of the town and Mantis was at $2.50. I recommended getting rid of them and if you did you made a little cash. It’s currently at $.50. I did much better on my sell suggestions than on my buy suggestions, but it wasn’t horrible. I think overall, if you went out and bought the cards I suggested last time, you would have come out on top (value wise) thanks to to the big gains of cards like Collected Company and Ugin. Sure you might have lost $3 on a few Sarkhan, but you would have made $48 in profit on a playset of Ugin. With Ulamog and Ugin already hitting their spikes and currently stabilizing, there aren’t a lot of colorless cards left that are worth talking about. Conduit Of Ruin ($1.75) is one card that I could see being played more after rotation. With the addition of Kozilek, The Great Distortion and World Breaker, there are suddenly a few more good targets for Conduit of Ruin to go after. However, that’s not what I’m looking at. 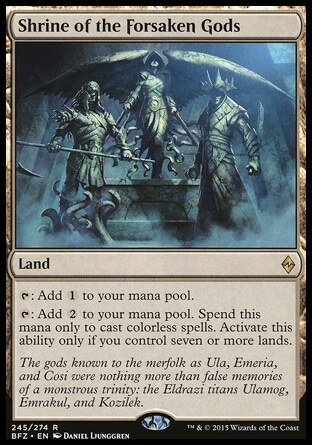 If the rumors are true that Emrakul is the “shadow” over Innistrad, that means that we’ll be getting another batch of colorless Eldrazi to play with. Conduit could end up being an integral piece of Eldrazi decks in the future. This is a longshot, but if Conduit hits $1 again (due to people realizing Heartless Eldrazi isn’t that good in the current modern environment), I think it will be a good investment. Even if Emrakul doesn’t show up in Innistrad, there’s a good chance that it’ll be back before Conduit Rotates. I also think Conduit will show up in Eldrazi EDH decks a lot. 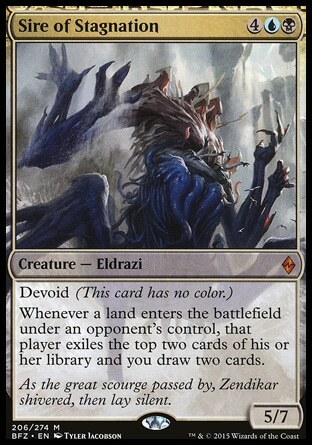 Just I said above about Conduit of Ruin, the old versions of the Eldrazi decks are all but forgotten. Eye of Ugin is most likely getting the ban hammer in Spring, which means cards like Blight Herder ($1) which showed up in past lists will go back to being bulk. I still think it’s a good card in standard with a few possibilities. If I could get a playset for $2-3 to hold on to, I wouldn’t be upset if they never changed value. Their potential upside could be pretty high though if they see a lot of play. If we get more exiling effects in SOI like a reprint of Rest in Peace, this card could be downright awesome. Why does this card seem powerful to me? It’s got a good body and a sweet effect, but hasn’t seen any play. I think this card belongs in a resource denial/land destruction deck, but at the moment that sort of deck doesn’t exist. Sire of Stagnation ($1.50) doesn’t feel like one of those junk mythic rares that we sometimes get (I’m looking at you Ghastly Conscription), but it does feel like a card that’s just waiting for the right combination of cards to become available in standard. It might not be this spring, but sooner or later I think Sire will see some play and therefore I’m hedging my bets and picking up a few at this price. Big potential upside, not a lot of downside at this point. 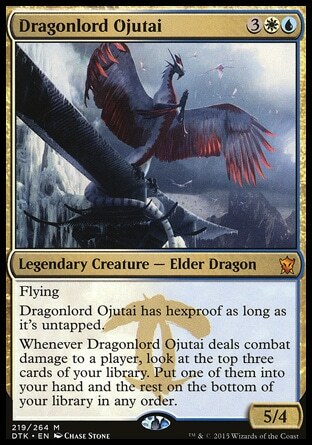 Ojutai was extremely powerful when Esper dragons was on top of the metagame, but she’s since been pushed to fringes. At $13 I would say Ojutai has almost hit rock bottom, and that if you were planning on playing any kind of control between now and September, you’ll probably want to grab yours now. I think she has one more price spike left in her this summer before rotation. There is also a future for Ojutai in modern as well in Jeskai control and a few other decks, so grabbing a few at $10-$12 might not be a bad investment. I don’t think she’ll hit $40 again, but $20 is a possibility. Abzan Aggro/Midrange is losing a lot of their deck to rotation (Abzan Charm, Anafneza, Warden of the First Tree), but that doesn’t mean Dromoka’s Command will stop being good. I expect GW decks to do well this spring and summer, and this card will definitely show up as a 4-of. It was reprinted in the event deck, but I don’t think it will go down much further than $3.25. It could also show up in modern in the near future, so I wouldn’t be surprised to see it double in price in the next few months. The price might go down a little bit more before rotation, but don’t wait too long. Bring to Light ($.75) was the cornerstone of an archetype early in BFZ standard, and I wouldn’t be surprised if people played it again in a 3-4 color mash up this spring. Sure we’re going to lose the fetchlands, but the BFZ dual lands will still be playable and we will also have the manlands to play with. Getting a playset for $3 isn’t such a bad deal for a playable card. It’s just going to take some time for it to adjust to the new meta. Jeskai’s Ascendancy ($.50) might have lost its most important parts to bans in Modern (Treasure Cruise and Dig Thru Time), but I think it’s only a matter of time before another card draw spell gets this archetype back on its feet. It might not be soon, but I like Ascendancy in the long term and will be holding onto a few extra ones just in case. Noyan Dar, Roil Shaper ($.25) seems like another card that has a shot at being in standard. I saw him back during the start of Oath of Gatewatch standard in Jeskai Ascendancy decks that use him to make all their lands creatures then untap them with a spell and attack when their power is high enough. I also saw Noya Dar in a UW Awaken control deck which has a good shot at becoming the next control deck in spring. Another card with lots of potential upside and very little downside at its current price. 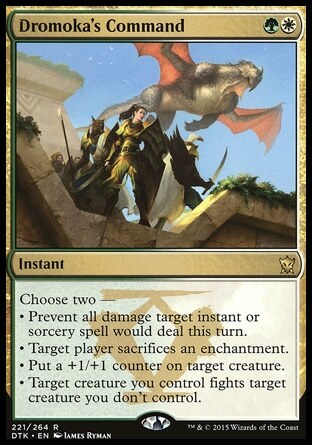 Speaking of control, if it does make a comeback I’d expect Ojutai’s Command ($2) to also become popular again. Keep an eye on it. 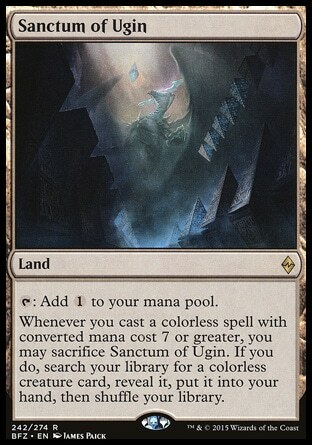 Both Shrine of the Forsaken Gods ($1.50) and Sanctum of Ugin ($1) should be safe bets for the next few months. I expect Eldrazi ramp decks to continue to be strong all through summer and since these lands are usually 4-ofs in these decks, I wouldn’t be surprised to see their prices double or triple before stabilizing. The lands are dirt cheap now so grab them while they still are. The farther we get away from BFZ, the higher their price will go. Lumbering Falls ($1.50) seems to be a good deal at the moment, and I wouldn’t feel bad about investing in a playset of them at that price. Shambling Vent sees pretty heavy play and is at $4.50 at the moment, so if Falls were to see some play after rotation it could reach similar prices. At the moment, the only semi-competitive deck that plays it is UG Eldrazi ramp, but that could quickly change. Aside from the colorless lands that are criminally undervalued right now, I think a majority of the cards in today’s article are a gamble. Yes they are undervalued and good deals now, but they could all end up being duds by the time I write the next set’s Bang for Your Buck articles in April. I think the odds are in my favor that at least 1 or 2 of these choices will bear fruit though. It’s all going to depend on whether or not players can figure out how to beat 4 Color Rally decks, as well as how soon Abzan players will abandon ship before rotation to move onto the next best thing. Keep your eyes on fringe decks that show up over the next few weeks. Look for decks that work well and have good synergy, but also decks that aren’t going to be losing a lot with the rotation of KTK and FRF in a few months. Other than that, what do you think of my chioces? Would you have chosen any differently? If so, which cards do you have your eyes on and why? Feel free to comment about this series of articles and let me know your thoughts on what cards you’d buy, sell, or invest in. Thanks for reading and be sure to check back next week for more articles about the metagame and other developments in Japan!